To Be Continued... | Graphic Design NY | Clare Ultimo Inc. The Globe Project (or "To Be Continued" as we titled it) was originally shown Ward-Nasse Gallery, NYC in 1991. 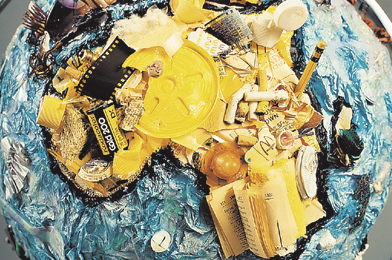 All the continents are made up of garbage we collected for months. It was our way of saying "this is what it will look like if we don't stop". It was inspired by Jo Obarowski, while she was still a designer at Ultimo. She initiated our participation in the project, and she put her focus, energy and ideas into it. 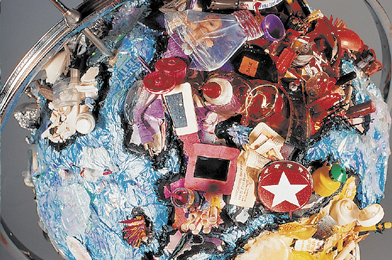 While we were all devoted to the ideas of recycling as a way of life, without her passion, it wouldn't have happened. "Working with Jo is (and will always be) an enlightening experience for me; this project ultimately brought out the best in both of us. The part I liked about it most was that towards the end of the project, our friends would pop into the studio and add pieces of appropriate garbage to the continents." "This creation blossomed out of our love and respect for the planet and it was truly a celebration to make. 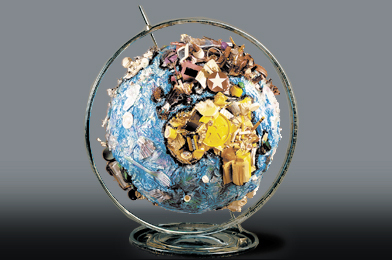 Transforming ordinary garbage and ugly waste into a playful and thought provoking world was our challenge. Together, we collected a variety of junk and built a version of the world that we fear may one day become a reality...Special thanks to my late dad, Edward Obarowski, who helped engineer the movement of the piece.